A fun lil project I worked on! But yea! i did a collab with , I did the sketch and line art and he did the coloring and shading! I love how this came together and how our art melds together! I hope yall like it too! 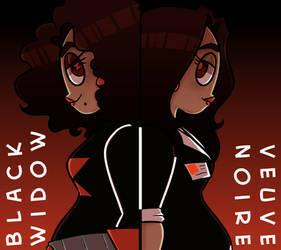 Black Widow gave a kiss, but stole a heart~! I would really love your guy's input! I am leaning towards one of them, but I want to hear what you guys think! Some of you may know me from tumblr! MY GF- <3 I LOV U SO MUCH!!! Soo as some of you know, school is starting up, and for me, that means im off at college! I wanted to tell yall because I will be more busy but hopefully (no promises) I will get more art done! I'm really excited to be in college and I just wanted yall to have a little update of my life! Good morning Criaha, Happy Birthday!, I hope you have a great day ^^.